"Dear Michael, I want to thank you for your help through the videos and preparation course for the PCCE test. I passed it with 617 (max is 700) because I should have study a bit more... I didn't get to take your final test sample but I did the one on the book. Anyway, it's a solid pass. Thanks again and we maybe in contact again sometime. "I just would like to say, "Thank you to you and your team!" The core of this course has been both resourceful and relevant. Each week I was impressed by the amount of information included in the lessons and the depth of the Videos. There are times one may not be certain when taking a course as such online; however, PEG proved to be more than I expected. When the study group was not available in the Atlanta GA area, I was referred to PEG through GAP, Janet Wilson-Williams. This was the best decision I could have made! I successfully completed the Review Course Friday 4/20/18. I feel that I am prepared to sit for the PCCE Exam (although I will study up to test date). Thank you for your integrity and passion for your commitment to preparing students and professionals for the next phase in their legal fields. 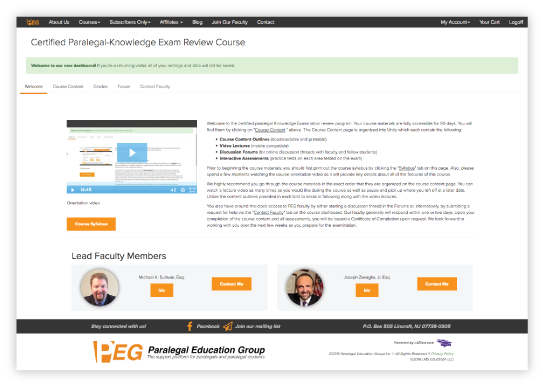 Our course welcome screen has all of the information you need to get started easily and immediately begin your certification exam preparations! 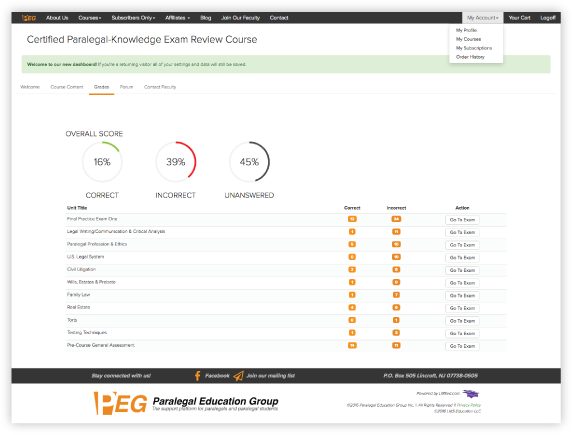 Each review course has course content organized into individual units so that you so that you can stay organized throughout the program and easily track your progress! All course modules are presented on separate pages with folders for outlines, lectures, and practice tests to help keep you organized! 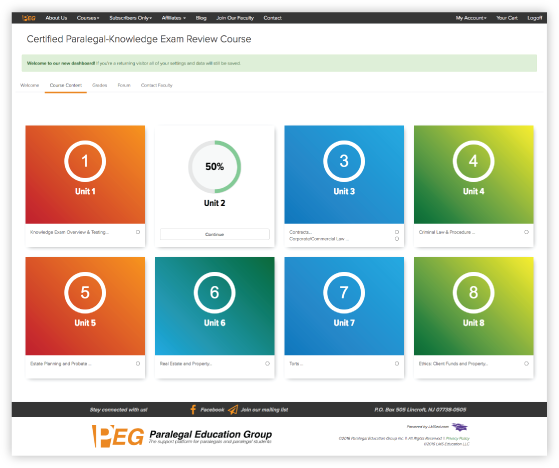 Each PEG review course contains hundreds of practice test questions with interactive feedback and detailed explanations for effective learning assessments! 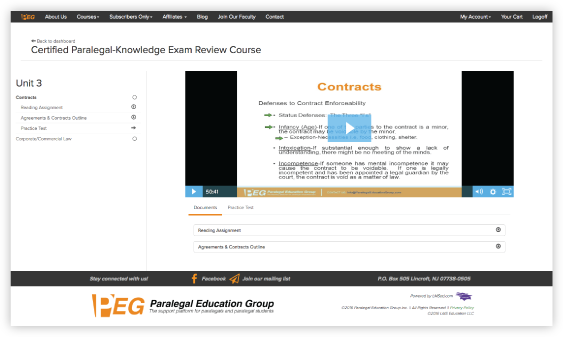 Review course students have around-the-clock access to paralegal faculty for questions, overall support, and virtual consultations. We are here to help you every step of the way! *Must complete all review course assessments and sit for exam within fifteen (15) days of completing review program.